As I write this note of thanks, it is difficult to know where to begin. The Make a Wish Foundation has given my daughter the sweetest gift. It was not the trip alone, but the inspiration she was given by all of the people she met. 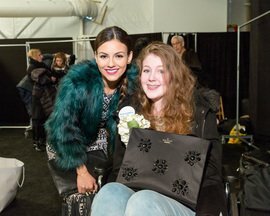 From the designers, to the drivers, to the Make a Wish volunteers, she was treated royally. Everywhere we went, she was met with kindness and care. I wish you could feel what I felt watching my daughter talk about her interests, her love of fashion, and her plans for the future. The latter was the most exciting. She was inspired to look ahead at possibilities. The Make a Wish volunteers here in New Mexico and in New York City, were helpful, supportive, and very gracious. They answered any and all questions with good humor. They also braved the cold weather in New York to be our guides and make the events possible. They went above and beyond to make Emmary’s trip fun and interesting. The drivers and hotel staff were also amazing. We became friends quickly and they looked after Emmy as if she were their own. A special thank you to goes to Bermuda Limousine Company and especially to our favorite driver, Eric, who was patient and a wonderful tour guide! It goes without saying that the hotel was beautiful! We would like to thank all of the doormen and the maitre’d at the Waldorf Astoria for every kindness. We also enjoyed our trip to the Empire State Building. We would like to send a thank you to Renita, a staff member at the Empire State Building, for making the visit enjoyable. Finally, we would like to thank the designers, their assistants, their security staff, and everyone at New York Fashion Week. The security staff made sure we were in the right place at the right time and also took an interest in Emmary. They inquired about her, her life, and her interest in fashion while expediting our ventures in and out of shows. The assistants met us at the events, and were helpful in every way. They made sure Emmary not only saw the shows but went out of their way to take her backstage to meet the designers. Emmary also met a number of celebrities and came away from New York properly star struck! As you can see from the photos my daughter was in fashion heaven! The designers and celebrities were gracious and generous with their time as they met and took time to chat with Emmy. She received gifts and photographs she will treasure. We would like to thank the people at Tanya Taylor, Kate Spade, Mara Hoffman, Monique Lhuillier, The Academy of Arts University, and EDUN for hosting us and making Emmary’s wish much more than expected. We would also like to thank Mr. Nigel Barker and wife, Chrissy, Mr. Brad Goreski, Ms. Jay Alexander, Brittany Snow, Jeanette McCurdy, Miss Universe, Victoria Justice, Frankie Grande , Chantelle Brown, Cobie Smulders, and many more for stopping and taking “selfies” with Emmy. I think our biggest thank you goes to Tanya Taylor and her family. Ms. Taylor took time out of her busy schedule to meet with us the day before her show in her studio. Emmy was able to ask questions about the fashion industry and we all fell in love with Tanya. She was so kind and truly an inspiration to my daughter. She embodies every lovely quality a young woman could have, and Emmary aspires to treat others in kind. Most of all we would like to thank Make a Wish for the time we were allowed to have as a family, watching Emmary have the trip of a lifetime. There were so many special moments, tears, and laughter we will never forget. You have Made a Memory for my daughter and family that words cannot describe. Please accept this thank you and gratitude from our hearts. You can be sure we will all pay it forward.